"Dancing with the Devil" is the debut art collection of drummer Chris Adler. 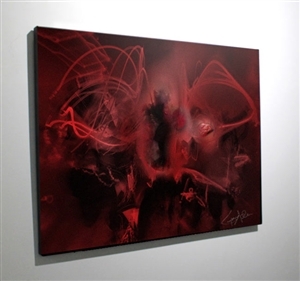 The collection's visuals are crafted from the new medium of rhythm-on-canvas, which is a unique artistic process that begins with Adler working with drumsticks that light, much like a painter uses brushes with oils. As artist, Adler constructed rhythms that would translate to canvas in remarkable ways for this collection. Then through an extensive second phase of creation, the images are brought into the Los Angeles studio of SceneFour. At SceneFour, the images and color channels are manipulated in a variety of ways to bring out the true abstract nature of Adler's rhythms. In total, there are 9 different works in the collection. Each are available in highly limited edition sizes and all are numbered and individually signed by Chris Adler.